A tale as old as time…boy meets girl, boy likes girl, boy applies oddly-named body scent, and boy gets girl. Or that’s the way Unilever sees it. After all, they have “been helping boy get girl since 1983.” I was a girl to be gotten post-1983, and all I had was Drakkar Noir foisted on me. I sent Eric out the Sunday before school starts for our biggest grocery shopping day of the year. We hunker down with all manners of packable foodstuffs. Since Gus is 10 and in the 5th grade, I thought it was time for some personal hygiene items. He is about as far from puberty (I just mistyped that and got autocorrected to “puppetry”!) as he is from puppetry (it works). But still, good to get in the habit as a pre-emptive strike. Eric, ever the marketer, comes home with Axe “Anarchy” stick. I guess “Fascism” was a little overpowering. I’m afraid to open it, lest I be assaulted by a British punk band. 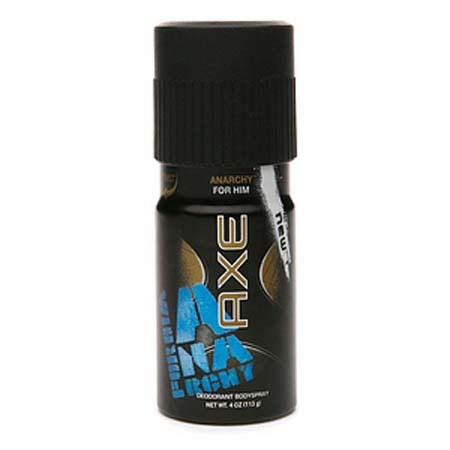 So I was curious what the array of choices were in the Axe deodorant stick line and consulted the website. “Twist” I get, and perhaps “Clix”, and maybe even “Dark Temptation” and “Excite” for the 6th grade and up crowd. But “Kilo” and “Phoenix”? 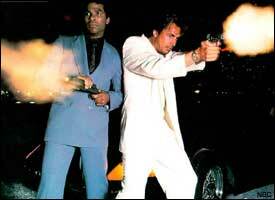 I get a visual of Tubbs and Crockett jumping off an exploding boat in international waters. Ok, I kind of get it now. Axe is first of all, overpowering. I think it’s the 21st century version of the club over the head and dragging the girl by the hair to the cave. Eric pre-screened and strangely “Anarchy” was the least abusive to the olfactory senses. And it had the bonus of being a vocabulary word he and Gus had discussed that very day. “Learning first!” is our motto. Next I checked out the link on “Responsible Use” thinking I was in for a lesson on moderation and appropriate body parts. It was a video on huffing and igniting! Let me be clear, against huffing and igniting Axe. Holy Suburban Bubble Buster! It would have never occurred to me, but I am now wise to the urban underbelly of hygiene product abuse. I feel like I’ve just watched “The Wire” and need to take my vocabulary street. Word. Anyway, when you aren’t huffing Axe, it can be applied to the body to draw the female like a moth to a smelly flame. And not just any girl, it only works on the one you want, with some sort of laser-like properties. That part was less clear. There were graphs and scientific data available, I’m sure. Problem is, Gus is 10, and describes girls as “all giggly and concerned about their hair.” True that. I worry about a dormant girl-catching magnetron, however. If unused, does it turn on the owner? “Boy, 10, Combusts on the 108 Bus!” I see an opportunity for another Responsible Use PSA. Even worse, what if it does work on that brainy, cute girl who doesn’t giggle and is into Minecraft, Mozart, and Math? Utterly whack. This entry was posted in Musings and tagged axe anarchy, axe body spray, deodorant, suburban mom angst by blmilhizer. Bookmark the permalink.